Click on the following link to watch previews of our upcoming "Empowering Silenced Voices" Concert on March 19, 7:30 pm at the Good Shepherd Chapel in Seattle. Jeremiah and Wendy were interviewed by King FM's Second Inversion about our upcoming concert on March 19. Click here to read the interview! Chorosynthesis has received a grant towards its upcoming performance projects. Stay tuned for more details! Wendy and Jeremiah will be heading to Nashville, Tennessee this October to present their latest research at the 2015 National Association for Music Education National Inservice Conference. For more information go to NAfME. Both Wendy and Jeremiah are excited to be presenting choral sessions at the upcoming Connecticut Music Educators Association Conference on May 2, 2015 in Hartford, Connecticut. For more information go to www.cmea.org. Wendy and Jeremiah successfully defended their dissertations at the University of Washington. Wendy's dissertation was entitled, Come Together: An Ethnography of the Seattle Men's Chorus Family. Jeremiah's dissertation was entitled, Visual and Aural Modes of Perception in Choral Performance Evaluations. Both Wendy and Jeremiah will be presenting their research at upcoming conferences. Steven Morrison and Jeremiah Selvey just published an article on conductor expressivity in the winter edition of the Bulletin of the Council for Research in Music Education. Read the full journal article at JSTOR. Chorosynthesis is very excited that the 2013 National Chorus America Conference will be hosted by Pro Musica and the Seattle Symphony/Symphony Chorus in our home town of Seattle. We hope to see everyone in the Emerald City! "The Annual Conference is the centerpiece of Chorus America's professional development and training opportunities for chorus leaders. Each year in June the Conference is presented in a different city, in partnership with a host chorus, and brings together more than 400 choral conductors, administrators, singers, board members, and business members." 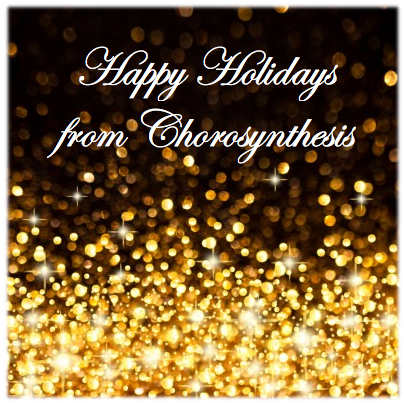 Happy Holidays from Chorosynthesis! We know that all of you have been hard at work serving your communities in song. Peace and blessings during this holiday season.